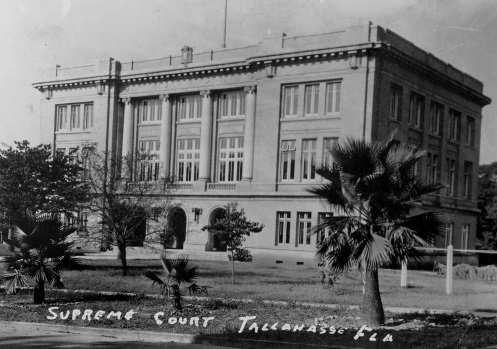 The history of the Florida Supreme is rich and colorful, a vital part of the Historical Society's mission to honor and preserve the important artifacts of institution for future generations. Listed on the navigation to left are a few of the projects that the Society has be involved is along with other interesting pieces of the Court's history. term of their "good behavior." In 1853 an amendment provided for the election by the people of the Justices for six-year terms. The 1861 Constitution provided for the appointment of the Justices by the Governor, with the advice and consent of the Senate, to serve for six-year terms. 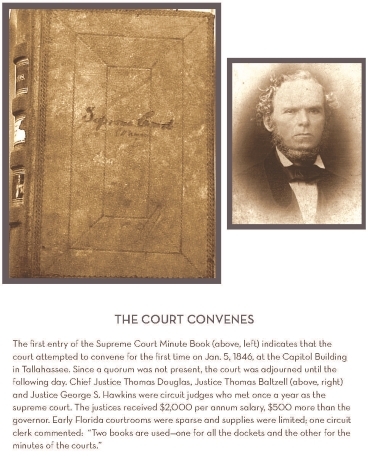 Prior to 1868, the Supreme Court met where and when the Legislature provided. The Constitution of 1868 provided that the Court hold three terms a year "at the seat of government." In the Constitution of 1885, there was a similar provision, except that the number of terms could be regulated by law. Now, the Court holds two terms each year in the Supreme Court Building, commencing respectively on the first day of January and the first day in July. Oral arguments are heard by all seven Justices.